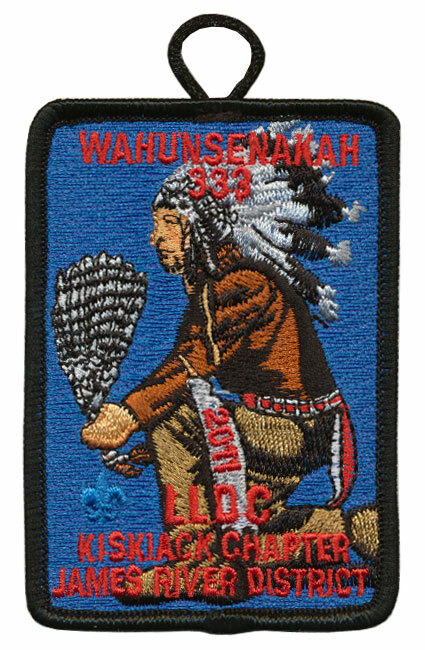 The US Coast Guard Yorktown Training Center was the site of the 2011 Wahunsenakah Lodge Leadership Development Conference on April 16. The patch issued for the event recognizes Kiskiack Chapter which serves James River District. Activity patches of the Lodge during 2011 honor each chapter with the design featuring their totem. 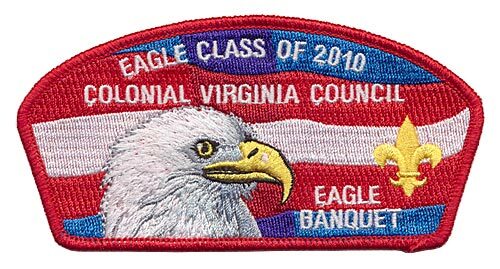 On March 18 Colonial Virginia Council honored their Eagle class of 2010 and celebrated the 100th anniversary of the Boy Scouts of America at a banquet attended by nearly 750 people at the Marriott City Center in Newport News. Virginia Governor Bob McDonnell was a guest of honor, describing the BSA as "the greatest character building organization for young men in America." The Eagle class was also honored with a commemorative shoulder patch (pictured above). 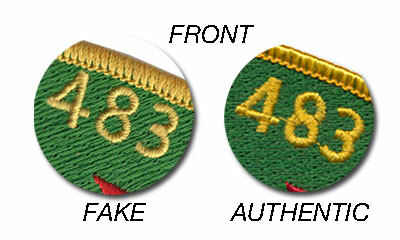 The CSP matches the ones issued to honor the Eagle classes of 2007 and 2008. 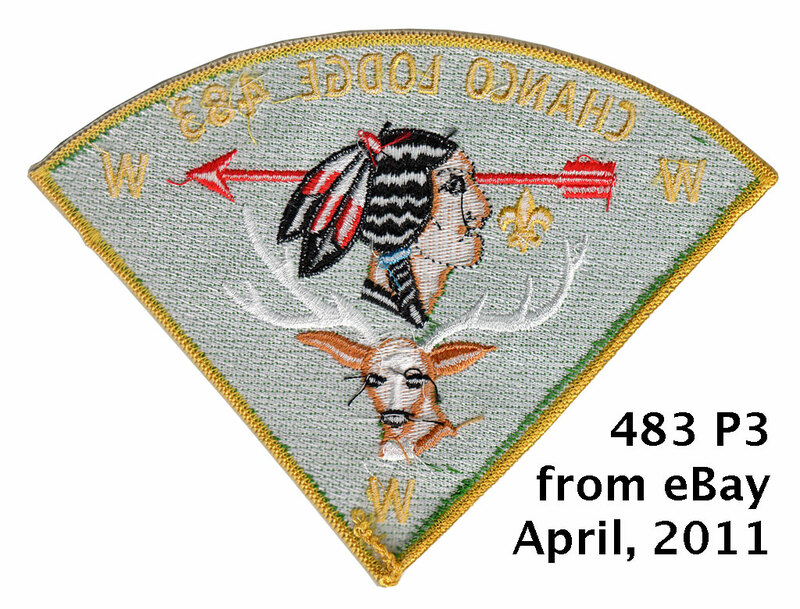 Last year a pocket patch in the shape of an eagle head was issued instead of a shoulder patch. 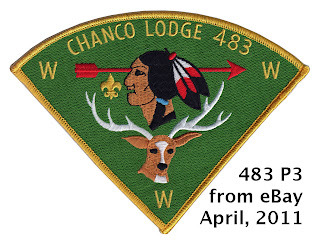 This month several Chanco neckerchief patches have been available for auction on eBay. 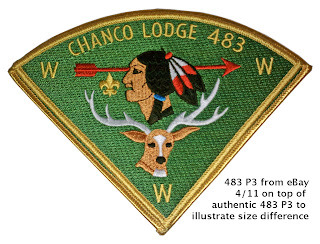 The seller advertises them as "jacket patches" but collectors in the know will quickly recognize them as a Chanco P3 ("P" indicating the patch is shaped like a slice of pie, and "3" indicating the third issue of this variety from Chanco Lodge). There are three pie shaped Chanco patches. All have essentially the same design and all were made to be sewn to a dark yellow cloth neckerchief. The P1 has no fleur d'lis, while the P2 adds one. The P3 has the same design as the P2 but is a "computer designed" version so the details are more precise. I was offered a chance to buy a Chanco P3 patch and promised by the seller it was authentic. He sent me a photo of the item and I studied it closely and believed it was authentic. Since I didn't have a P3 in my collection I requested assistance from three other longtime Virginia OA collectors (one a former member of Chanco lodge) to validate its authenticity after it arrived. Before I had a chance to send them pictures I noticed an auction for another Chanco P3 from the same seller. Already beginning to doubt my purchase I asked him how many he had and where they came from. 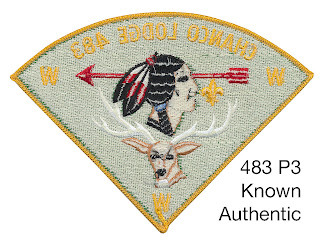 The seller advised me he thought he had six but wasn't sure, and he bought the patches at a sports show in Milwaukee mixed in among a group of 50 mostly military items for a fixed price, and believed them all to be authentic. I decided to request a refund for my reproduction 483 P3 which the seller graciously agreed to send as soon as he receives the patch. For those of you contemplating bidding on this item, know that it is not an authentic issue of Chanco Lodge and there may be hundreds more where these came from. Since the design is so incredibly close to the original I suspect the reproductions were made from the punch patterns used to fill the original order by the lodge in the late 1990's. Throughout this article are pictures of the front and back of both an authentic Chanco Lodge P3 and the reproduction found on eBay recently, as well as closeups to help you discern the differences if you happen to encounter one at a trade-o-ree or conclave. Click on each to see larger versions. The details that differentiate the reproductions from the original are extremely subtle and without direct comparison with an authentic issue are virtually impossible to discern. The solid embroidered green background of the original is almost perfectly horizontal while the background stitching of the reproduction is slightly angled. The reproduction patch is also slightly smaller than the original, but only by a few millimeters, so you would be hard pressed to notice the difference without a direct comparison. Below is a photograph of the newer patch on top of a known authentic 483 P3. 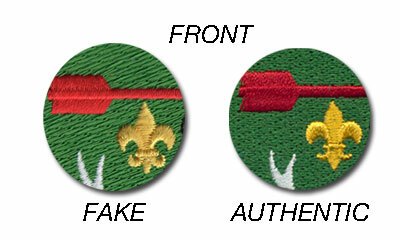 Michael McCaughan provided the above photo and reports that the brown thread colors on the newer patch are noticeably darker than those of the original. 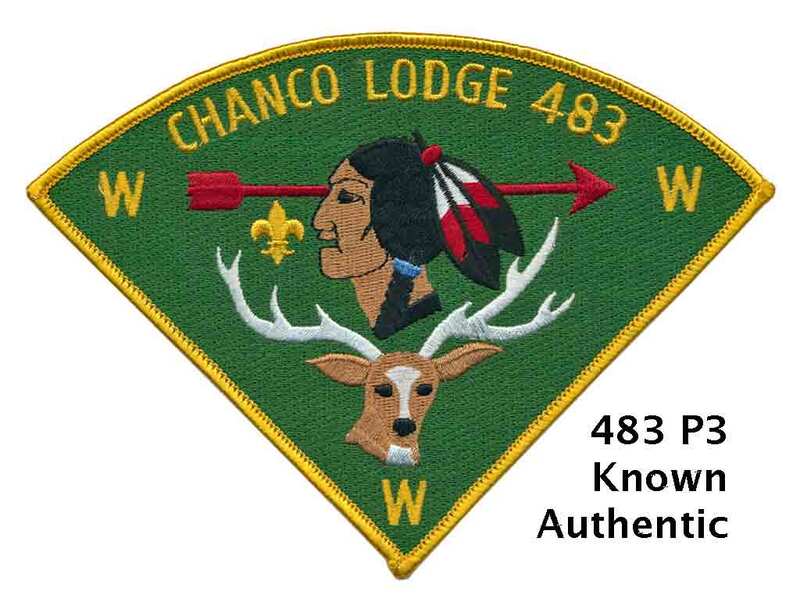 One of the tell-tale details on the front of the patch that will help you differentiate it from an authentic Chanco P3 is the detail in the end of the arrow. On an authentic version the arrow shaft blends with the fletching, while on the reproduction the details are much more precise and the shaft is quite defined. Robert Rudd kindly emailed me to point out that the curves on the FDL's are quite different. 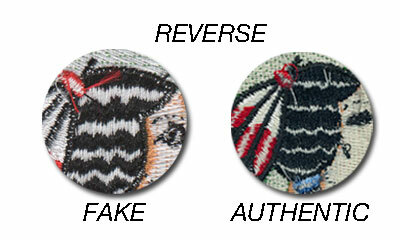 On the fake version the tips point upwards, while on the authentic version the tips point to the side. Perhaps the most easily spotted difference on the front of the patch is the way that the numbers 4 and 8 are embroidered in the text spanning the top. On the authentic version the horizontal bar in the number 4 crosses OVER the vertical line, while on the reproduction the bar crosses UNDER the vertical line. You'll also notice the number 8 has a difference as well. The line crossing at the center goes from top left to bottom right on the original, and from top right to bottom left on the fake. Perhaps the most obvious difference is on the reverse of the patch, where the white bands in the brave's hair are significantly wider on the new patch compared to the original. I hope this will help you spot this new patch and avoid disappointment. If you have any additional details please share them in the comments below or feel free to email me directly. My sincere thanks to DeWitt Holland, Larry Johnson, and Michael McCaughan for their photographs and kind assistance in researching this emblem.